May 23, 2018 | By Advokaten | Filed in: Additional Functionality. 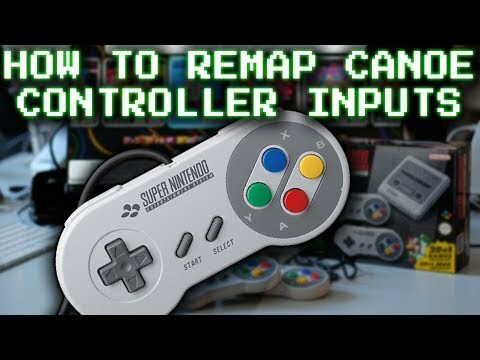 This is Remap Canoe Controller, this allows you to edit the controller inputs used in Canoe and Kachikachi. The A and B buttons are swapped. The B and Y buttons act as A and B. Any controller connected to the port(s) at the front of the Mini, will be recognized as a Nintendo Clovercon controller, including controllers connected via bluetooth recievers such as the 8bitdo Retro Reciever. You can edit gamecontrollerdb.txt before and after you install the hmod. Updated current database with an additional 60 controller mappings for future purpose. How do I edit the inputs after installation? Edit gamecontrollerdb.txt located in either NES or SNES folder, depending on which system you want to edit. Changelog: v1.1 – Added NES/SNES specific config files (thanks to bslenul) This allows one set of inputs in SNES Mode and one set of inputs in NES Mode. v1.0 – Allows remapping of controller inputs, across all firmwares.